Rats make great pets, they are intelligent, affectionate and playful. They are also very social colony animals and should always be housed in groups of 2 or more. Three rats of the same gender are a great number and hardly need any more time and space than one rat does, so please keep them with other rat friends. Personally if I were to go back to keeping a small amount of pet rats, I would keep a group of 4-6 rats of all different ages, introducing a new rat after an old one passes away in a revolving group. I would do this because this way the adult rats are used to new rats coming in every 6 months or so, and also by staggering the ages, you won't end up having all of your rats getting old and passing on around the same time, which can be hard on you emotionally and also on your last lone old rat. But often people keep them in groups of just two or three, which is acceptable as long as you're prepared for what will happen if one is left alone in the end, you may have to introduce another older rat or two babies or rehome your last rat if it is sad on it's own and you're not looking to keep more into the future. Once you have decided what kind of group dynamic you'd like to keep your rats in, you can get some ideas below on how best to keep your ratties happy and healthy. There are many ways to keep rats as pets, what suits you might not suit another person, but what’s most important is that your choices best suit the rats health and happiness, and then secondly what options are most convenient and fun for you. Unfortunately there is lots of misinformation around about the best ways to keep rats, but not much of it is actually that dangerous, just often impractical or over the top. Luckily lots of that misinformation is being cleared up slowly over the past few years. 5+ Years ago rat keepers would scold if another keeper didn't have the right hammocks or kept more than 1 rat per square foot or didn't handle each rat for 1 hour a day, and other ridiculous rules. But nowadays rat keeping is being done in a lot more practical ways, taking into account the natural behaviours and living conditions rats have evolved to. Rats don't require lots of handling, they are perfectly happy living in groups never getting handled by humans, but of course they will make much better pets for you if you do handle them a lot. It's the same with housing them, you need to remember that they've evolved to live underground in cramped damp quarters with heaps of other rats in a colony type situation, avoiding leaving the safety of the den during daylight and are most active at night. We then expect them to live well to human ideals, in an open airy cage with only 1 other rat and to sleep during the night and come out at day. Obviously people can't keep a huge number of them as pets, burrowing in the back yard, they'd quickly turn wild! That and they can live happily adapting to the human ideals, but it helps to recognise their natural behaviours and find a happy medium I think. Other than those basic needs of the rats themselves, the rest is all about what suits you and your situation best. Eg. If you want to colour-code your cages with pretty accessories, perfectly acceptable. But of course the rats don't care at all, the colours are for your enjoyment. If you guys enjoy taking the rats on excursions or letting them free range all day, great! but the rats certainly don't require it to live happily (unless maybe they're used to it and then you suddenly stop). Cages- The most common housing for pet rats is a cage, but unless adapted to suit the rats health, a plastic tub or series of tubs may be better for the rats and cheaper for you. Cages are good in that they come (some-what)ready to use and rats love to climb the bars, but they can also be very draughty, and can be hard to clean. You can get a number of small cages suitable for 2-3 rats for under $100. The best type that I have seen is featured below, as it has 1cm bar spacing, and a deep 10cm plastic base to keep the substrate/bedding from being kicked out. It might be a good idea to create some solid plastic or coroflute walls around the outside of your cage on the sides and back to stop draughts coming in and substrate falling out. 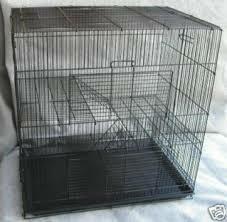 This cage is a similar size and price, but it has a very shallow base and bars across the bottom. It can be altered to be suitable if you sit it in a deeper plastic tub and remove bars at the bottom. But the above model is better in my opinion. If you would like to go for a larger cage for 4-10 rats, the below examples are suitable for around $120-350. Another option besides a cage is a plastic tub or glass tank adapted to be a suitable house. There are many ways to do this and depending on your skills you can get very creative and save some money this way. Tubs and tanks are good because they are easy to clean and they can help keep rats healthier(if kept clean and ventilated only at the top) as they stop draughts and temperature fluctuations. You might want to add a few more hides and/or ropes and tunnels to climb on because of the lack of wire walls to climb in a tub or tank. If choosing a plastic tub (or two or three) as your rats home, be sure to choose ones with completely smooth interiors, as if there are any ridges or wheel hubs the rats will get a teeth-hold and be able to chew their way out of the tub. A smooth surface also helps with keeping it clean. A good option for a simple tub or tank conversion is to build a set of two wooden frames that just fit over the edges of the tubs, then staple aviary mesh sandwiched in between the two frames, so that when placed over tub as a lid, the wire rests on top of the tubs edges and holds the lid in place. the extra frame on top of the wire helps keeps food cubes in place so that you can use the lid as a large food "hopper" like mentioned below. Another option is to cut windows into the plastic lid and attach aviary mesh onto the inside(so the rats don't chew the inside edges). Here is an example of a very professional tub conversion. Here are some quick sketches that I've put together of proven methods to make tub racks and tub lids. The more complicated lid with hinges and the tub tower are just designs I quickly put together, not sure if they would work, but there are so many options for fitting a stack of tubs into a certain corner or space if you have the imagination and can find a good series of tubs. Just remember no to leave any 'easy to chew' edges or lips inside the tubs, including where tunnel wholes are cut. A Grotto is a piece of furniture that is converted into a suitable home for rats. In most examples a cabinet or bookshelf has a wire-doored front added to it. It needs to be kept indoors to avoid draughts. It is very important to adapt a grotto to be completely waterproof and easy to keep clean. Exposed wood is not much good as it will absorb urine and begin to stink very quickly, for this reason most wooden hutches designed for Rabbits or Guinea pigs will not work long term unless painted with a number of coats of non-toxic paint and any chewed spots touched up regularly. If using a laminated piece of furniture, it is a good idea to seal all of the edges with non-toxic resin, sealant or superglue, to make the area water(urine) proof. Grottos are best kept indoors in temperature controlled areas with no draughts, because they have a large open front, as apposed to a tub with an open top instead, they are very susceptible to cool breezes and bad vertical ventilation which can both contribute to make rats sick. That along with shelves with no deep lips to keep substrate in, without a particle-substrate to filter through; small crumbs and dust will be left in the open for the rats to sniffle up. Substrate- A type of substrate such as paper-based Kitty Litter, Chaff, Dust extracted and Kiln Dried Wood Shavings or Agrisorb Hemp Chips work really well as they help keep the smell at a minimum, and they allow for food crumbs and other dust to filter through to the bottom, away from the rats sensitive noses. Flooring such as fleece material, lino or uncovered plastic or wire are not ideal, as they allow the rats to snuffle up all the dust particles, and they also get soiled and stinky very quickly. Newspaper and Shredded paper are okay to use for rats, but they do get smelly quite quickly and you will find that it needs changing every 2-3 days to keep the smell under control. At the moment I am using a mix of 70% 50/50 Lucerne-Oaten Chaff and 30% Hemp Chips. I find the Hemp soaks up any moisture really well, but on it's own it doesn't combat the odor as well as the chaff. These are the two bags I buy. The Chaff can be found at most large stock feed stores, the Hemp can be bought through australianratforum or at Dandenong Stockfeeds. 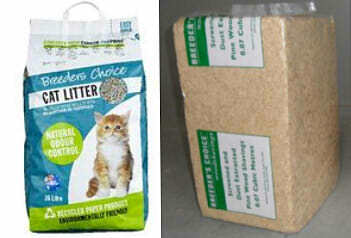 Breeders Choice recycled paper kitty litter can be bought at most supermarkets, but it is the most expensive option per kg. And breeders choice 'kiln dried and dust extracted' wood shavings can be bought at Superpet Warehouses and perhaps other large pet stores. Another tip for keeping smell at a minimum is to sprinkle a light coating of Baking Soda/Bi-Carb Soda to the bottom of the cage before adding substrate. It does not harm the rats even if eaten, and it really helps soak up and dissipate the urine smell. Rats can also be litter trained to do number 2 in a certain area. Rats will naturally choose one corner to do most of their business in as they mature, simply put a container with a different substrate in it into this corner and begin placing the ‘raisins’ into the litter tray. It may take a couple of weeks or months but they will soon get the idea. Play time/free range- Though rats can get along just fine with no human interaction as long as they have other rats as friends, that wouldn't be much of a fun pet would it? And rats really do enjoy exploring and socialising. If you only keep a few rats you should aim to let them out of their cage to be held or run around in a safe and secure room as often as you can, but an hour a day is more than adequate. When outside of the cage they should always be supervised as, just like children, they can get into a bit of trouble while you’re not watching them. You will want to keep them away from dangers of course; Chewing electrical cords is the biggest problem, but you'll also want to avoid toxic plants, baits and poisons, and tin-foil/chocolate wrappers(gets stuck in their gut). You will find that rats will try to nibble on or chew nearly everything as a test to whether they can eat it, sharpen their teeth on it, or tear it up to use for bedding. Watch that items both inside and outside of their cage that they can reach are not toxic if eaten and/or precious to you or your family. I find that anything rubbery (cords, remote control buttons, etc) are a favourite chew toy for rats. Toys- Because you can’t play with them 24/7, your rat’s cage should be filled with friends to play with but also toys and obstacles to keep them entertained. These could include Ladders, tunnels, a large plastic ‘rat’ wheel(not mouse sized or metal, try dapper.com.au for Wodent Wheels) Treat-toys, hoops, ramps, tubes etc. Anything that they can explore and/or chew. Temporary toys can be small cardboard boxes or toilet rolls that they can chew up. But a rats favourite toy is usually another rat, they love to wrestle and groom eachother. Food- Rats need a balanced diet to stay healthy. They are also free feeders and require a constant supply of food. Specially formulated 'Rat Cubes' are the best diet for rats, these are little cylinder shaped pellets which are designed to be an entire diet for a rat. Some good brands include Cummins Mill Rat/Mouse cubes, Laucke Mill and Barastock. I highly recommend buying one of these brands from a stockfeed store or large pet warehouse store. (They typically sell in 20-25kg bags, but some pet stores will sell smaller bagged amounts). Do not buy a rabbit/guineapig food as it is too 'grass based' for them and they will be starved of many nutrients. Also stay away from 'rodent mixes' from the supermarket which are mainly seed based, as this is very fatty and unhealthy as a rats main diet. But if you can't locate a good 'rat cube' for sale, a home made dry mix is the next best thing, and then veggies, fruits and meats every second day or so. See the bottom of this page for more info. Food dishes need to be heavy and low so that they can not be spilled. Two other options are food dishes that mount to the side of the cage and wire hoppers that hold the food in and the rats chew at it through the wire (this eliminates food wastage). Any wet or perishable food should go in a separate food dish. Be aware that rats like to stash their food, so be sure to not overfeed them just because the food is disappearing (being hidden away) and remove any perishable food before they begin to turn bad. Here's two examples of home-made food hoppers. One made from wire, the other uses a small cutlery drying rack which can usually be found for a few dollars in most department or $2 store. Water- Water is the most important thing your rat needs. Always make sure that clean water is available. A rat can be affected within just a few hours of not having water, dehydration can quickly lower their immune system and lead to other illnesses taking hold. It's recommended not to put water in an open bowl, as your rat will either tip it over or fill it up with bedding. There are several good types of water bottles available, most mount on the outside of the cage with a sipper tube that fits in-between the bars, I had the most success with the glass varieties, as plastic bottles sometimes drip or leak more easily. Or if you have a large number of rats, a gravity fed watering system might be a good set up for you. Temperatures- In general rats best handle temperatures from 10-25 Celsius, though they can cope with colder temperatures better than they can hot. If your rats get too hot you should find a way to keep them cool. A fun way to do this is to introduce some ice-cubes or frozen fruit/veggie slices to their cage. Rats can die in heats over 30c, or when left in direct sun. Grooming- Most rats will clean and groom themselves if not each other, but occasionally once every second month they may require a little help from you. Generally rats do not like taking baths, so if this is too much of an ordeal for you and them you could always try wiping them down with a warm damp wash-cloth instead. Only use baby and/or mild pet shampoo on your rats and avoid getting soap on their faces, eyes and sensitive areas.